True story. I LOVE falafels, but I don’t always have the time or energy to slap together 20-30 little patties every time I want to make them from scratch. Especially being the perfectionist that I am. Every little patty would have to be perfectly formed or else they would fall apart into a big heap of crumbs. Which would drive me CRAZY! 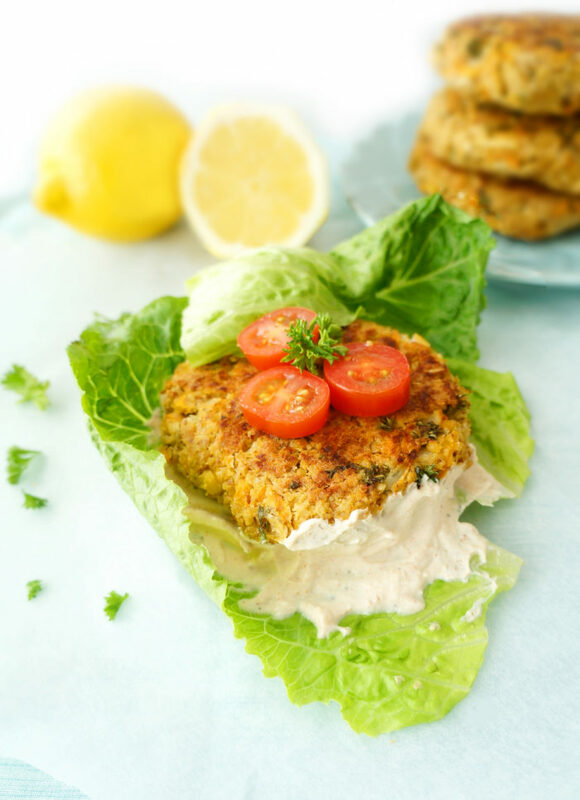 Enter these lemon falafel burgers. They have the same ingredients and taste of a falafel but are a lot less work to make. I can totally slap together 6 patties in no time! Plus, they’re bursting with flavour, especially when you top them up with the Greek yogurt tahini spread. I tried them with lettuce wraps, in a salad, with a bun and on a tortilla and they were equally good every time. 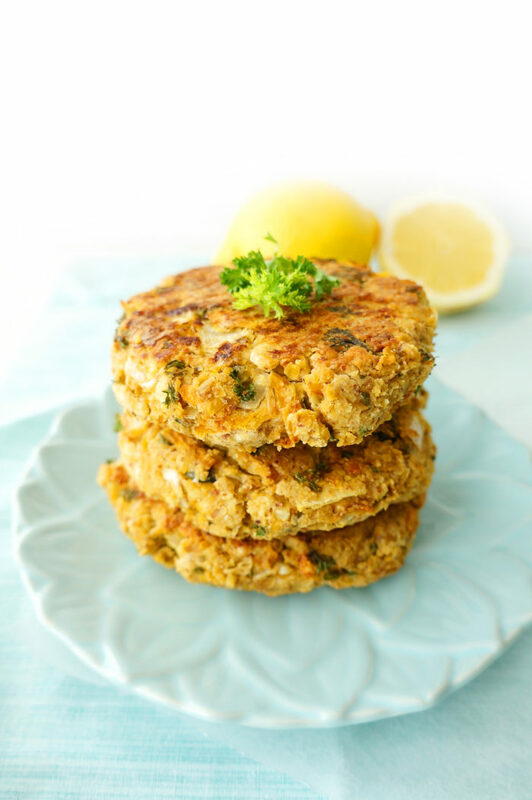 They make a great meatless option and are packed full of fibre and protein! And with the addition of the shredded carrot, it’s a great way to sneak in some extra veggies and vitamin A! Preheat the oven to 375 degrees F. Place the chickpeas in a food processor and process until the mixture reaches a mashed consistency. Alternatively, you can mash the chickpeas in a bowl with a potato masher or fork. Next, add the mashed chickpeas and remaining burger ingredients, except for the olive oil, to a large bowl. Mix the ingredients until well combined. You may need to add a bit of water to help the mixture bind together. If mixture doesn’t stick together, add one tablespoon of water at a time until it binds together (I added two tablespoons of water). Line a baking sheet with parchment paper. Using your hands, form the chickpea mixture into 6 evenly sized patties and place them spaced apart on the parchment paper. Lightly brush the surface of the patties with olive oil. Bake in the oven for approximately 35-40 minutes, or until firm and lightly browned, flipping after about 30 minutes. In the meantime, combine all the ingredients for the spread in a small bowl. 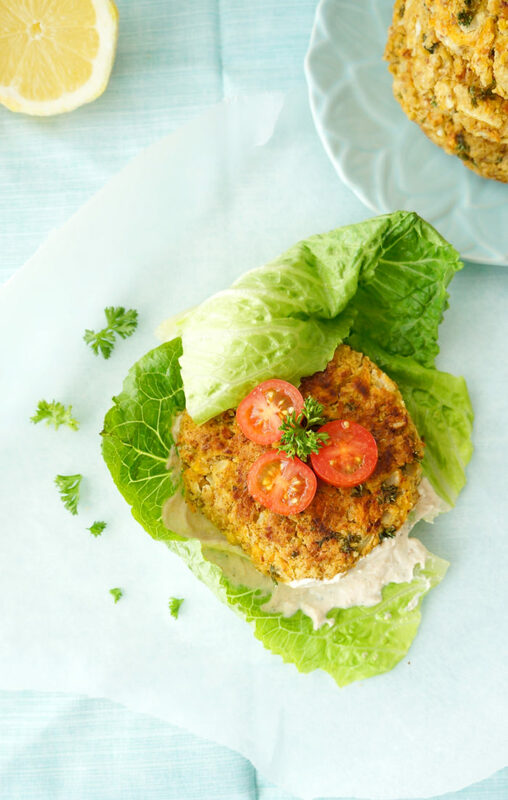 Serve falafel burgers on a lettuce wrap, bun, or pita or in a salad topped with the Greek Yogurt Tahini spread. Thanks Deborah! Falafels are my favourite too. I could seriously eat them every day! Falafel should be in burger form more often! These look delicious! Thank you Abbey! It makes a really tasty burger! These look so yummy! There is a wine event we go to every year and they have food trucks there so I always go to the one with the falafel wrap! Thanks Carrie! That sounds like a fun event — you definitely can’t go wrong with falafels! Truth: this post made my mouth water. I’ll be making this next week. Check! Haha thanks Rachel! Let me know if you try out the recipe! Mmmm. I love a good falafel! and these sound delicious! Love all the flavor combinations! Thanks Mikki! The lemon flavour really kicks it up a notch! These look so yummy! I am definitely going to try them for dinner!! Thanks Kalee! Let me know how you like them if you have a chance to try them out! These are a great addition to Meatless Monday! Love how easy and flavorful these look! Thanks Jessica — definitely a great recipe for Meatless Monday! And super easy too! Yum! These look so delicious. I love falafel and can’t wait to try this recipe!! Thank you Angela! Hope you enjoy the recipe! Thanks Rebecca! I’m totally with ya…falafels are the best!